Karin Hibma has a firsthand understanding of the power of design and visual thinking in our economy and culture. 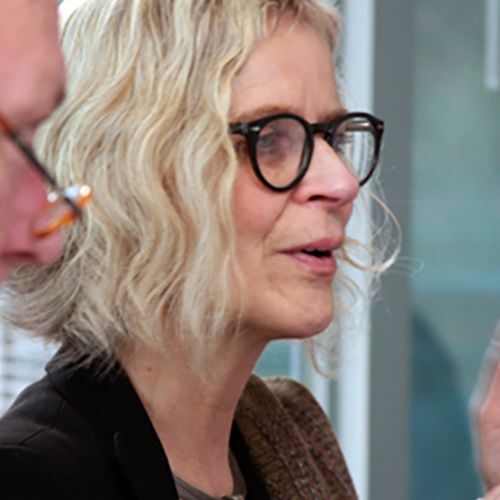 As a strategy partner in San Francisco-based design firm : : CRONAN : :, Karin has concentrated on incorporating smart design processes and thinking into finding ‘the big idea’ for clients as diverse as Levi Strauss, Estee Lauder, the San Francisco Museum of Modern Art and Amazon. Hibma also founded and is the president of Cronan Artefact, a product development, manufacturing and marketing company known for its Walking Man clothing line. After completing her BA in Fine Art at California State University, Sacramento, Karin founded and managed her own creative research company, Design Resource, to work with artists, photographers and filmmakers on advertising, commercial and documentary projects. Hibma also researched and wrote Creativity: The Human Resource, a major traveling exhibition funded by Chevron, which examined the creative process of contemporary Americans such as John Cage, Judy Chicago, Merce Cunningham, Jasper Johns, Lawrence Halprin, Margaret Mead, Linus Pauling, and Jonas Salk, who have made major contributions in the arts and sciences. In June of 2009, she and partner Michael Cronan were named two of Fast Company’s 100 Most Creative People in Business.